The most frequent way police are able to search is by asking you for permission. 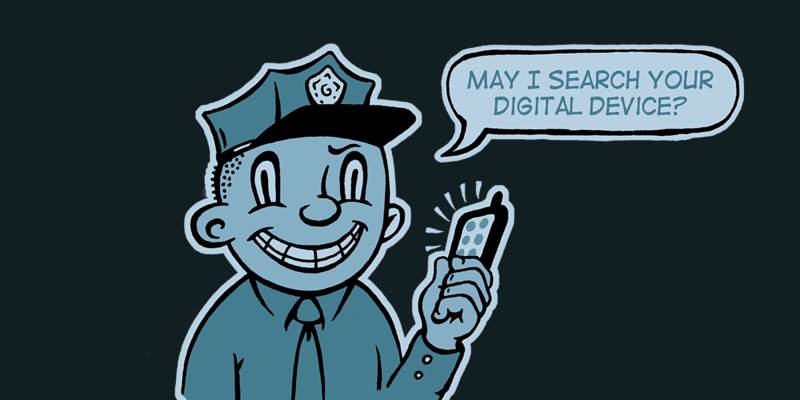 If you say “yes” and consent to the search, then police don’t need a warrant. You can limit the scope of that consent and even revoke or take it back after the officers begin searching, but by then it may be too late.1 That’s why it’s better not consent to a search--police may drop the matter. If not, then they will generally need to get a search warrant to search. There are two major exceptions to the warrant requirement. First, if you consent to a search, then the police can search within the scope of your consent.2 That’s why it is usually better to not consent to a search. If the police want to search your computer, it doesn't matter whether you’re the subject of their investigation. While the police are searching your home, if they observe something in "plain view" that is suspicious or incriminating, they may take it for further examination and can rely on their observation to later get a search warrant.19 For example, if police see an open laptop with something obviously illegal on the screen, they could seize that laptop. 1. Florida v. Jimeno, 500 U.S. 248, 252 (1991). 2. Schneckloth v. Bustamonte,412 U.S. 218, 219 (1973); United States v. Lopez-Cruz, 730 F.3d 803, 809 (9th Cir. 2013); United States v. Vanvliet, 542 F.3d 259, 264 (1st Cir. 2008). 3. Ker v. California, 374 U.S. 23, 39 (1963). 4. Illinois v. Rodriguez, 497 U.S. 177, 181 (1990); United States v. Stabile, 633 F.3d 219, 230-31 (3d Cir. 2011); United States v. Andrus, 483 F.3d 711, 716 (10th Cir. 2007). 5. Georgia v. Randolph, 547 U.S. 103, 106 (2006). 6. United States v. King, 604 F.3d 125, 137 (3d Cir. 2010). 7. Fernandez v. California, 134 S.Ct. 1126, 1134 (2014). 8. Riley v. California, 134 S.Ct. 2473, 2493 (2014). 9. United States v. Flores-Montano, 541 U.S. 149, 152-53 (2004). 10. United States v. Arnold, 533 F.3d 1003, 1009 (9th Cir. 2008); United States v. Ickes, 393 F.3d 501, 507 (4th Cir. 2005). 11. Almeida-Sanchez v. United States, 413 U.S. 266, 273 (1973); Arnold, 533 F.3d at 1006 (9th Cir. 2008); United States v. Romm, 455 F.3d 990, 996 (9th Cir. 2006); United States v. Roberts, 274 F.3d 1007, 1011 (5th Cir. 2001). 12. United States v. Cotterman, 709 F.3d 952, 957 (9th Cir. 2013)(en banc). 13. Federal Rule of Criminal Procedure 41(f)(1)(C). 14. Wilson v. Arkansas, 514 U.S. 927, 929 (1995). 15. Federal Rule of Criminal Procedure 41(e)(2)(A)(ii). 16. Marron v. United States, 275 U.S. 192, 196 (1927). 17. Andresen v. Maryland, 427 U.S. 463, 480 (1976). 18. United States v. Mann, 592 F.3d 779, 786 (7th Cir. 2010); Brown v. City of Fort Wayne, 752 F.Supp.2d 925, 939 (N.D. Ind. 2010). 19. Horton v. California, 496 U.S. 128, 133 (1990); United States v. Walser, 275 F.3d 981, 986 (10th Cir. 2001); United States v. Carey, 172 F.3d 1268, 1272 (10th Cir. 1999). 20. Compare 18 U.S.C. § 1001(a) (maximum punishment for first offense of lying to federal officer is 5 or 8 years) with 18 U.S.C. §§ 1030(a)(2) and (c)(2)(A) (maximum punishment for first offense of exceeding authorized computer access is 1 year). 21. United States v. Hill, 459 F.3d 966, 974 (9th Cir. 2006); In re Search of 3817 W. West End, First Floor Chicago, Illinois 60621, 321 F.Supp.2d 953, 958 (N.D. Ill. 2004); see also Federal Rule of Criminal Procedure 41(e)(2)(B). 22. Federal Rule of Criminal Procedure 41(g). 23. See 18 U.S.C. §§ 982, 983; Federal Rule of Criminal Procedure 32.2. 24. Mancusi v. DeForte, 392 U.S. 364, 369 (1968); United States v. Ziegler, 474 F.3d 1184, 1189 (9th Cir. 2007). 25. Schowengerdt v. United States, 944 F.2d 483, 488-89 (9th Cir. 1991). 26. Ziegler, 474 F.3d at 1191. 27. City of Ontario v. Quon, 560 U.S. 746, 748 (2010); O’Connor v. Ortega, 480 U.S. 709, 722 (1987).